Sign grinned to herself as Sage leaped ahead, somewhat surprised. Dealing with slippery stones wasn't exactly a sea or a storm favored obstacle, but this other handled it quite well. The question was surprising enough, however, that she found herself frowning in thought as she tilted her head, trying to focus on the stones and her answer at the same time. "My greatest fear..." she murmured, thinking at first of the scars on her hide. "My greatest fear. I think that would have to be having something terrible happen to my bonded." She paused here as Songhue leaped over another gap and landed with her toes gripping separate stones, blushing when she saw the fae raise her brows quizzically. Rushing on, she scowled at the stream and watched the water slosh around her feathering. "I had another, before her, and we were close.. But she had to leave me behind. It was hard, and it hurt, and it scared me, worse than any other moment in my life until then. But when Songhue gave me a place to settle at, it was better. For the first several months she mostly sat nearby, leaving me alone and making sure I didn't get stuck in seaweed or have any trouble finding the fresh lake near by. But she forgot to do the same for herself, forgot to eat, and when I was finally used to everything and walked over to talk to her she was surprised to find she could barely stand up. She didn't think about it, of eating or caring for herself while she was focused on me, I know, but.. It scared me. It scared me so bad. I had just gotten adjusted, had just accepted the lands and this strange creature that was so patiently waiting for me, and she wasn't well. With the one before her, I knew I could go to her whenever I needed, I knew where to find her, but she didn't just... Just sit and wait and watch, just in case. She didn't slip the seaweed off my hooves and back away before I even had a chance to jump at the touch. Nobody had, or ever has yet. Only my bonded has. I'm scared to death of losing that." Songhue shook her head slightly, surprised and slightly ashamed of herself. That, at least, explained the mother-henning that the mare was often prone to. "It probably seems silly... She's actually pretty good about taking care of herself, and whenever she does something that isn't that good for her it's always because she forgets. And I know she has plenty to help remind her, even then. Everyone in Sunlit Shadows is a part of her clan, and there's still others; her mate, her brother. One of her aunts comes by regularly, and they help remind each other all the time. I know it's silly, honestly, so you can laugh if you want. There's really no reason for me to to be scared... But it's still my greatest fear. Sign had fallen rather still after she had finished her explanation, the current tugging at her tail as she became lost in her own thoughts. Thought of when she was left behind, of finding herself in a strange new land with this strange creature entrusted to share her awareness and heighten her abilities. Thoughts that went back to panicking when that creature swayed weakly, and running around for anything she could think of to help before she was finally soothed. To having seashells woven throughout her mane, and long talks that lasted late into the night. So much had happened and so much time had passed, but that one moment, in the very beginning, was still her greatest fear. Songhue hopped sideways with a flick of her wings as Sign's head drooped slightly, reaching over to touch the mare's shoulder. Snorting, Sign lifted her head and regarded the fae with a mildly shy smile. Smoothing her rain soaked mane, Songhue looked back at her and tilted her head curiously. "I'm alright," Sign nickered, nudging her cheek as she shook herself free of her thoughts. "I'm fine. Come on, bet you I can reach the end of the stones first." Chuckling, Songhue moved sideways once again, hopping forward and landing cat-like across three decent sized stones. She was almost even with Sage now, and Sign was right behind her, trying her best to balance just right as her soft hooves couldn't cut into the stone as well as the others' did. 'Tis a curious notion, to be a crab. What might that be like? The thought flicked across Songhue's mind with a grin as she glanced at Kyra's crab-like posture, silently admiring the way Silver dashed to her next spot and how it had seemed quite a simple challenge for Sage to leap into the front. She paused just a moment too long watching the others, however, and found herself bumped by Sign; it was either leap or fall, and so she leaped! The next landing didn't go quite as smoothly, making her sway sideways and land on one hand as she gripped the stones with her feet, laughing as her right hand landed on yet another stone and her left wavered in the air for balance. With one large shove she managed to right herself, looking up into the storm as lightning flickered overhead yet again. "Mm, by my choice, then, be it?" "Not yet!" Sign snorted, grinning as her tail whipped about her bonded's head with her next leap. "Vineda! Ask Silerflash a question. Anything you want!" Songhue shook her head, offering Vineda a mildly sympathetic smile. Sign had answered any questions about the game, only to tell the poor girl to ask yet other questions! The irony was amusing. 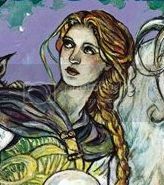 Vineda nodded thoughtfully at Sign's answer, understanding both the mare's and the fae's sides of the matter. "Thank you Sign, for sharing." It was a close look at the mare, a personal question, and she felt she ought to thank her. Just a strange quirk she'd gained from being raised in such a formal setting, she guessed. She was falling behind, though, so she focused all of her energy on her next leap. Choosing the largest stone out of those nearby, she steeled herself and jumped. It was probably a little silly of her to be so proud at sticking the landing in the center of the rock, especially since she'd chosen such a large landing area. But she was pretty prone to general clumsiness, so she let herself enjoy her little victory. "Ha!" She muttered under her breath quietly. Her grin widened and she nearly laughed aloud as she caught the tendril of thought from the fae friend she'd become so well attuned to... She also wondered what it was that fascinated them all with the idea of being a crab. With her grin still fresh in place, she glanced around to notice that Sign had passed Songhue and Sage. As she heard Sign's request she froze slightly to be put in the limelight. In general she was not the type of person to ask for any information not purposely given, not one to pry. Formality, again. This was game was going to be much more challenging than she'd originally guessed! She spoke slowly, as though reluctant, and gently. An apology even in asking? "Silverflash. We all have different takes on faults... our own as well as others'... What do you consider your biggest fault?" She longed to duck her head, but she knew she at least owed the mare the respect of meeting her gaze as she asked such a question. Silverflash tossed her head playfully and smiled at Kyra, but was careful to keep her balance. Being called Princess by her bonded, was how she got teased by her. It was a little nick name that had come about. She'd been called it so many times now she wasn't quit sure who had called her that first, though she believed it to have been Sparkle. The mare then turned her attention to the others. She watched Vineda make a good jump and land successfully. After Shamrock's bonded made her move her eyes fell to Sage. Silverflash watched in sheer amazement at the fluid, long and fast jump the mare had made to place her in the lead. How could she do that? That was a far jump and Sage did it with such easy and only faltered her landing for a fraction of a second, she thought bewildered and admiration. She would love to be able to do that, but she doubted it would end with a good result. That mare was one with the storm and all it's elements, from what it did to the stones, how it made the river go faster than normal and also how the rain stuck to them. Her attention turned to Sign after Sage's had asked the question. The question would be hard for anyone to answer and the answer the mare gave brought back her own past. She too was left once, but her mind had seemed to have locked it away. She did not remember much of her past, but all that mattered to her now was she had Kyra and her bonded- family. They cared and loved her and that was what mattered. She also understood What Sign's fear was. She too, worried sick over Kyra and her family when ever they are down or sick. Not too long ago Kyra had needed them all. Her bonded was strong, but this event and it's ripples had hit hard. Kyra was dealing with it and was better, though all her bonded's were still keeping an eye on her. Kyra laughed at Silver's reaction and then turned to watch the moves of the others. Vineda had made her move with no over shooting this time. Sage had made the boldest move of the game yer with her double jump. The mare seemed completely at ease in this weather and with the slippery terrain. Her question to Sign was an interesting one and the blue mare reply made complete sense. She totally understood worry over a loved one, or more resent being worried over by her bondeds. She flicked a glance to her silver mare and knew from a quick flicker in her pastel blue eyes what she was thinking. One thought being that Silver had had a previous home and was left. The other being that she had and was still worried over her. She thanked her and her other bonded everyday for their support and love. Kyra had had to deal with two of her other bonded's having lost their first bonded. There was shy and angelic Peace, whom still was shy, but she was opening up and seemed happy. Then there was her first bonded, Amber, she knew the mare's story. Kyra came back out of her thoughts and focused on the others once again. She watch Sign and Songhue make their moves with easy. She laughed a the fae's question. Then she watched and was surprised at Sign's move, now placing her in the lead. Her attention focused on Vineda for a minute and then to Silverflash as the girl being ask to ask a question did so. It was an interesting one, but Kyra had a slit feeling she knew the answer already. Silverflash felt Kyra's gaze on her and it comforted her, as she new it was to her bonded. Her attention moved to Sign and Songhue as they each took their turn. Sign now in the lead, but her question surprised her. She turned to look at Vineda, and waited to see what she would ask. It was a good question and she had to think on it for a few moments. "My biggest flaw, I think is, that I care too much of what people may think of me through my actions that I do play one of my nick name's role. I play the little princess, since it makes me believe that is what others wish too see and will please my family and others... Though thanks to Kyra and my bond family I am learning to that what other's think doesn't matter, if you are not being your true self. So, I am working on being a little more me ,with others outside my family, since now I am being more me around them." Silverflash felt her pulse race and she felt totally embarrassed, but she made sure only a fraction of a second did it show in her eyes. This question was hard to answer, but now that she had she felt a bit of a load off her shoulders. She knew her family had picked up on the two Silverflash's, but others would not, being they only saw the one with glimpses of the other. With that said she turned her attention back to the stones and choose her target, it was a bit farther than she linked, but she was determined to make it. So she took a deep breath and jumped for the next set of stones. She landed with only her one back leg shimming the water. Silver was satisfied now that she had pulled up beside Sign, so no one was in the lead. Kyra listened to her mare and new that was what the answer would be. She and her other bonded's had noticed that the mare seemed to act like a different serian outside of their home. Though Kyra totally understood, she too was like that in the world she came from. Being with her family and friend here, in her homeland, or in Sacred Valley where the places she could be her true self, she too was working about being like that all the time. Kyra turned her attention back to the game and looked at her options and chose her target. She rocked on to her feet as she used her hands to push her forward into a squat position and then stood to get a better view at her target. She jumped and landed with not too much trouble it would be the next jump that was hard. The two options were on forward diagonals from her stone. She now was just behind Silverflash. It was surprising, how they all opened up in front of her. They spilled out such precious and heartfelt secrets about themselves, and not one chided the other or belittled their responses. Were all bonded such caring creatures? And these Serians, too, she'd met her fair share of ill-mannered and poor-tempered ones in her time... but all of them made her feel something she hadn't in a long time. She felt welcomed, and she was humbled by what they shared with her. A part of her wondered if she could ever actually go back to being alone, after seeing how easy it was to just not be alone. Silverflash's response in particular got to her, she was so timid but growing stronger like the storm in her blood. Someday she would be a force to be reckoned with, and already she showed much maturity in openly assessing herself and what she needed to improve on. Sign's world seemed to revolve around her bonded, and the mare sympathized that she went through such hardship. But the fact that a human meant so much, were they all that bad then? Just as some Serians left a bad taste in her mouth, she had realized that equally as many were worthy of being befriended, admired, cherished. Could bondeds be the same? She leap across another stone, though her mental turmoil made one leg slip into the water. She flicked it dry discreetly, hoping it had gone unnoticed. Everyone was now pretty much parallel, though she might have had a small edge from being ahead last time. "I want to hear something about Vineda." She didn't ask, but she wasn't always the most socially polite kind. She anticipated being able to be dominant when the time called for it, though she did know how to be gentler when it was needed. Vineda listened to Silverflash's answer closely, bowing her head slightly as she finished, tempted to thank her. Sage took her turn then, and as she stated her desire the girl nearly gulped. The spotlight was really on her now, so of course her mind went blank first thing off the bat. Something about me... Her nerves didn't last too long; there was nothing to be scared of here in this game. She wondered briefly at the intentions behind this blue-marked mare's demand. "I know not what would interest you about me, Lady, so I shall tell you something general. I am a wanderer, and though I have a land to call my own, I cannot stay there overlong. Some days I adventure, others I explore. I spend part of every day searching, though I know not for what. Often times a bonded or a friend accompanies me if they wish, but sometimes the journey is taken alone. At the end of the day I try to do something special for at least one person, and making someone else happy makes my day." She'd told the mare "something", even if she did feel her answer was inadequate. It was impossible to shake the feeling that the mare was looking for something specific from her, though she couldn't place what. A small shake of her head accompanied her thought, lending it finality. If there was something the lady wanted to reveal, she would do so in her own time. Vineda refused to dwell on it too much; there was a game to be played! To dispel some of her extra energy she took a quick leap to a stone a medium distance away and landed successfully, drawing just ahead of the other members of their little group. Not knowing the mare's name still was growing a bit difficult. In her address, she looked once more directly at her. "Lady. Would you tell us your biggest regret?" She'd answered the demand earlier, but still could not bring herself to demand in return. OOC| Are we meant to wait for Sage or is it my turn?